Provide comfort for the family of John Kastrinakis with a meaningful gesture of sympathy. 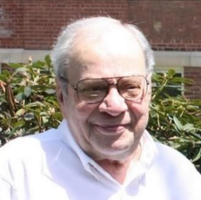 John George Kastrinakis, 84, of Galway Court, Lenox, died Monday, February 25, 2019,at Berkshire Medical Center. Born in Springfield on December 28, 1934, son of George J. and Athena Hassepelis Kastrinakis, he was a graduate of Classical High School and attended the Julius Hartt Conservatory of Music in Hartford, CT. For 5 years he served as Concert Master for the Young People’s Symphony in Springfield. Mr. Kastrinakis was the owner/operator of Pittsfield Radio Co., Inc. He had, at one time, worked in the electronics and insurance industry. Mr. Kastrinakis was a past president of the St. George Greek Orthodox Church Council in Pittsfield. He was also a Past Master of Evening Star Lodge in Lee, a past member of Shriners, Kiwanis and Chamber of Commerce. He also served in the United States Army. He was an avid fly fisherman and member of Trout Unlimited and the Atlantic Salmon Association..
Mr. Kastrinakis leaves his wife, the former Joyce Poules, whom he married May 24, 1964. He is also survived by three sons and their wives, Jason and Sabrina Kastrinakis of Pittsfield, Alex and Lynsey Kastrinakis of Hancock, and George and Sheila Kastrinakis of Lee,; his daughter-in-law Catherine Kastrinakis of Lenox; nine grandchildren, two great grandchildren, and a sister Hariclia (Happy) Theocles of South Carolina. He was pre-deceased by his son, Paul J. Kastrinakis, who died February 7, 2019. To send flowers in memory of John G Kastrinakis, please visit our Heartfelt Sympathies Store.